Prep cooks are the foundation of a strong restaurant kitchen. Before you can make it to the kitchen though, you’ll need to get your foot in the door. 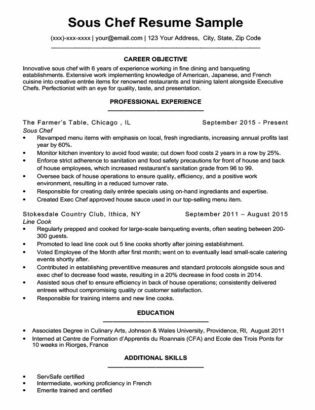 Our prep cook resume sample and tips will help you secure your next interview. Feeling nervous about resume writing? Our free resume builder will make the process a piece of cake. 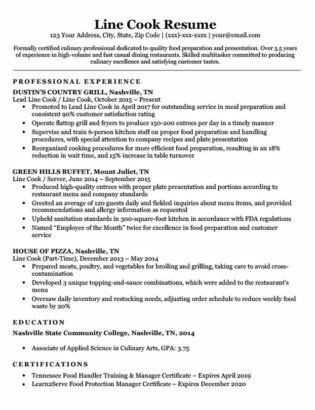 Looking for a different job resume? Check out our other resume samples to find the right industry. Want to inject some style into your resume? Spruce things up after taking a look at our free, downloadable resume templates. Stressed from drafting your cover letter? Take a look at our helpful cover letter examples for some extra inspiration. Enthusiastic and detail-oriented culinary professional with a thorough understanding of health and safety regulations. Positive and reliable team player dedicated to efficiency and punctuality, with a proven ability to work well under pressure. Comprehensive knowledge of seasoning and preparing food for maximum effect. The resume objective should highlight your strengths in a concise way. Since recruiters spend an average of 6 seconds reading an individual resume, it’s important to make sure your objective leaves a lasting impression. It shouldn’t be too lengthy — so keep it short and to the point. Add flavor by using vivid language to highlight your technical skills and provide hiring managers with a sense of your work ethic and personality. For help spicing up your resume summary, check out our list of power adjectives. As an entry-level position, the education requirements for prep cook are generally minimal. To come out on top then, it’s wise to note any skills and capabilities both inside and outside of the kitchen, regardless of whether or not you have a formal culinary background. 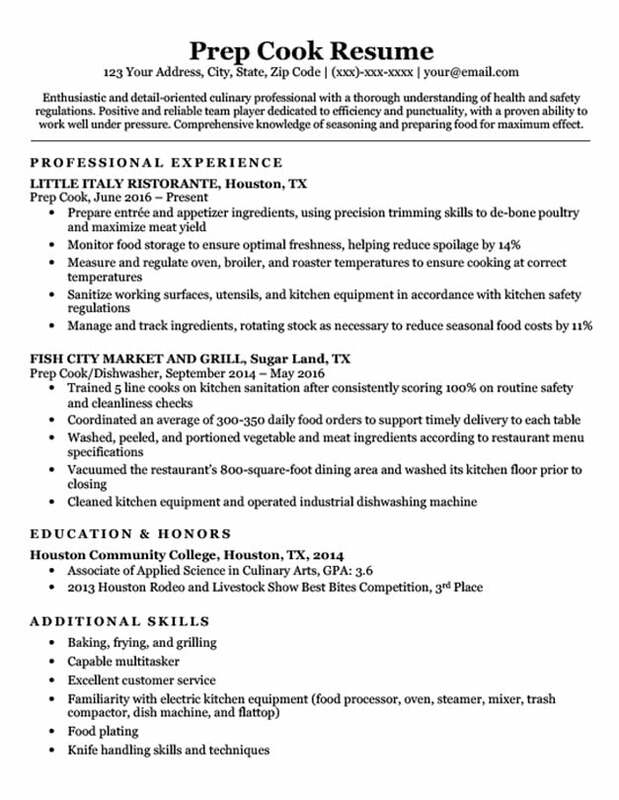 This might include familiarity with standard equipment operations, cooking techniques, and people skills, as seen in our sample prep cook resume. Our sample candidate lists both technical and soft skills to demonstrate their expertise. Depending on the job posting’s specifications, consider including familiarity with preparing a certain type of cuisine (e.g., seafood, Mediterranean, Vietnamese). Identifying key skills in the job description and including a combination of relevant hard and soft skills will inform employers that you’re more qualified for the role than the average Joe. Set yourself apart from other applicants by quantifying your past achievements in the dining industry. By including specific numbers in your professional experiences, your resume will give a more tangible sense of the potential contributions you could bring to a restaurant kitchen. How many people have you previously worked with in the kitchen? Have you managed or trained any people? What’s the average customer volume of the restaurants you’ve worked in? Have you ever helped standardize or improve any kitchen processes? How many years have you been in the food service industry? What’s the size of the kitchen(s) you’ve worked in? 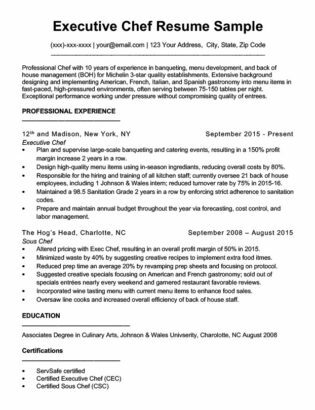 Are you ready to craft the perfect prep cook resume? Cook up a winner with our free resume building software.